AFLPNG Asia/Pacific manager Andrew Cadzow has arrived in Port Moresby to oversee upcoming PNG coaching updates and school programs as part of the development of the game and to discuss with his large on ground staff the future of the sport for 2011 and beyond. With a busy schedule awaiting Mr. Cadzow, he is hoping to improve the structure to the 2011 season so that development within PNG can reach even greater heights. 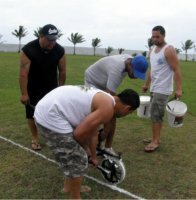 He will be overseeing the plans for the AFLPNG Academy in 2011, and will be hoping to improve the facilities as well as increasing the ways in which the system is run. “We are aiming to consolidate its position as a premier institution whilst creating the opportunity to partner with both the private and business sector to improve facilities, give more opportunities for higher level coaching, whilst ensuring the boy’s education is paramount”. The AFLPNG Academy was established in 2010 and was a great success in its initial year. Building on this success, AFLPNG recently appointed Moses Kar as the New Director of the Academy. Also on the agenda for Mr. Cadzow will be to re-establish senior football in the nation’s capital. “Senior footy was once a great strength across the country, we are looking at recovering the game to its former glory, to make AFL a premier sport in PNG and make these senior footballers role models for the 40,000 juniors playing the game”. Senior football will be kicked off for 2011 during Australia week with the Mosquitoes playing against a touring Australian Squad at Amini Park on the 12th of March. “Australia week will be an exciting time. The 12th of March will be packed with AFL football, from 9am there will be footy clinics for the kids, this will be followed by friendly game with expatriates, and the main game featuring the Mosquitoes will be in the afternoon”. Sporting icons playing for the “Australian Bolters” include Rugby League star Matt Rogers and former AFL players Peter “Spider” Everitt, Aussie Jones and Mal Michael. The rest of the suad will be comprsed of a selection from AFL Queensland.